Lube Civitanova played their first preseason match against Sieco Service Ortona, a team in the Serie A2 on Wednesday, September 5th. While many Lube players have not reported due to their obligations to their respective national teams, over 500 fans showed up to see the debut of Yoandry Leal and Robertlandy Simon in a Lube shirt. 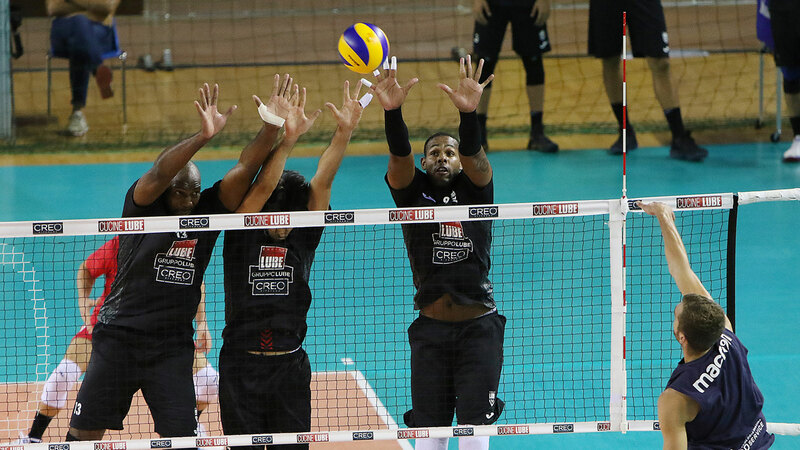 Leal started at the outside hitter position, and Simon was placed at opposite, where he is expected to play until Tsvetan Sokolov recovers from a knee surgery from earlier in the summer. Simon led the math with 16 points in a 3-0 (25-23, 25-18, 25-19) sweep over Ortona. Leal was right behind him with 15 points. Dragan Stankovic started at middle and scored 5 points. Their other middle blocker, Enrico Diamatini finished with 11 points. Pier Partenio ran the offense at setter. Christoph Marks, a German outside hitter, led Ortona with 12 points. Michelle Simoni scored 9 points in the middle. Mattia Sorenti scored 12 points from the other outside hitter position. Lube held a 62% to 40% advantage in attack for the match. They also held an advantage in service receptions of 68% to 46%. Lube had 8 service aces to 5 aces for Ortona. After the match the two teams chose to play an extra set for practice purposes.